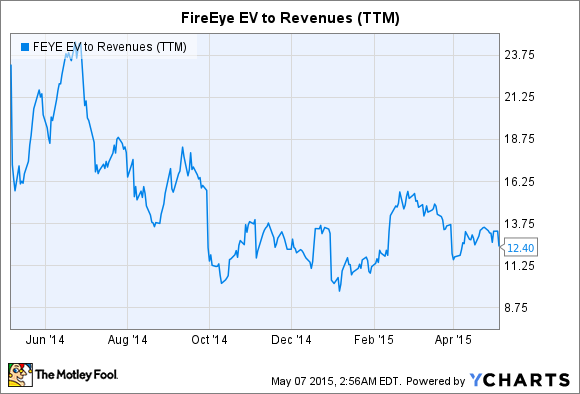 Is FireEye Inc. Stock a Buy? FireEye is one of the more innovative companies operating in the cyber security space today, but is it a worthy investment? In an increasingly digital world, cyber crime is one risk that virtually all companies -- regardless of their size or industry -- must contend with. In the face of these digital threats, security vendors may offer interesting investment opportunities. FireEye (NASDAQ:FEYE) is one of the more notable companies operating in the space. It's a rapidly growing company dominating a market niche it helped establish. Unfortunately, its business model is fraught with risks. When it comes to cyber security, there are all sorts of threats -- and just as many solutions. Traditional forms of security like anti-virus software use what's termed a signature-based approach to scan a PC for malware, comparing the software installed or running on that PC to a database of known threats. Traditional firewalls work in a similar fashion, blocking known intrusion methods. In general, it's a very effective solution, but it has significant limitations. FireEye's technology does something quite different. Using a network of virtual machines, FireEye runs suspicious software in a virtual environment, checking to see what it does in real time. This allows it to detect the zero-day attacks that traditional forms of cyber security can't stop. Zero-day attacks are carried out using exploits unknown to the security community. Since they haven't been discovered, they aren't in any database, and traditional forms of security can't stop them. But FireEye can -- in 2013, it identified 11 zero-day exploits, more than all of its competitors combined. More generally, FireEye specializes in stopping advanced persistent threats -- hacking attacks carried out by organizations (sometimes governments) against particular targets. Rather than the more general malware that may seek to data-mine any PC it invades, APTs are active, specialized campaigns. The recent attack on Sony Pictures stands out as a prime example. With its 2014 acquisition of Mandiant, FireEye can also analyze APTs to determine their source. There's certainly robust demand for FireEye's services. Late last month, the company turned in its fiscal first-quarter earnings report. Revenue grew 69% on an annual basis, while billings grew 53%. At the end of the first quarter, FireEye had a total of 3,400 customers, up from 2,200 customers in the same quarter last year. Next quarter, FireEye expects to generate around $140 million to $144 million of revenue. If it does, it will represent further annual growth of around 50%. This stands in contrast to market leader Symantec, which has posted fairly insignificant revenue growth in recent quarters. FireEye's products are novel, cutting-edge, and enjoying robust demand. What's not to love? Firstly, it's not a profitable company. Last quarter, FireEye posted negative free cash flow of $16 million. FireEye is seeing robust demand, absolutely, but only because it invests so heavily in selling its product. In past quarters, FireEye has spent almost as much on sales and marketing as it has generated in revenue. Though that percentage is declining, it's still projected to spend about 66% to 70% of its revenue on marketing next quarter. An investment in FireEye assumes it can continue to grow its business rapidly and eventually transition to profitability. FireEye's services are widely viewed as best-in-class, but FireEye faces a lot of competition. Larger vendors may be able to devastate FireEye's business by bundling increasingly comparable products with other services. There's also some debate on the size of FireEye's total addressable market. Because of the novel nature of its products, FireEye's services are often unaccounted for in the budgets of IT departments, making it difficult to project. In the past, FireEye's management has suggested that the size of its total addressable market could be as large as $30 billion, but some analysts are skeptical. Raymond James pegged the figure at around $3.6 billion in 2019. The appropriateness of an investment in FireEye may have more to do with the investor than the company itself. For a growth-oriented, more speculative portfolio, FireEye could make sense. It has a relatively short history as a publicly traded company, but at its current price, it's about as cheap as it has ever been on an enterprise value-to-revenue basis. FEYE EV to Revenues (TTM) data by YCharts. But FireEye isn't a value stock, and it's future is far from certain. Those looking for a more established business should probably look elsewhere.